Hi and welcome to my stop on the Studio Calico + Hero Arts Blog Hop! I just love these new stamps so much that I have a couple projects to share with you today. First up is this soft and sweet little card. Those polka dot clouds are so adorable! And they even are sized just right to work with the Fiskars Cloud Punch. That diagonal pattern along the bottom was created by repeatedly stamping the line/flag stick image from the Hooray (ST509) stamp set. I love to come up with new ways to use stamps to create fun background patterns. My next project is a cute little bookmark. I think it would be perfect to stick inside a book for a friend or include it with a gift card to a bookstore. To create the bookmark I folded a 4"x3.25" piece of cardstock in half and sewed along the top and right edges. The left side and bottom need to be left open so it can slide over the page. Super easy! I know I'll be making more of these. Be sure to leave a comment on each stop of the hop for your chance to win some of these fabulous new stamps! Hero Arts is giving away five sets each day of the hop (Monday - Wednesday), and the winners will be drawn from ALL blog hop comments! Your next stop is Sasha Ferina! Love love love that bookmark! That bookmark is such a great idea perfect for thankyou gifts your card is lovely too the little bird is so cute .. Thank you for sharing the card is so cute and I love the bookmark. This bookmarking is so amazing! WOW!!! Both projects rock Kelly!!! I especially need to CASE that bookmark for myself and daughter.....thanks for the wonderful inspiration!!! This bookmark is really a great idea ! Love it !!! Love these stamps! Especially love your bookmark! I'm in a Book Club and this looks like a fun project for me! Your bookmark is an awesome idea! I love both your projects! Such fun ideas. Will take up that bookmark idea. Such a clever bookmark--thanks for sharing! I love that bookmark. I will have to steal that idea. Beautiful idea for a gift! So lovely ! thanks for the idea and the giveaway. Clever bookmark, i have to try this idea. Love the book mark that is way cool. I want so many stamps and they keep coming out with new ones what am I to do?? Cute card and love the bookmark so much. Wow you had me at Clouds and woodgrain! These are some wonderful projects You've inspired me to make some bookmarks for my kids. What a great little bookmark! That will have to go into my holiday gift ideas to make...can't believe I'm already thinking of the holidays, lol! Love the bookmark! What a great idea. The bookmark is adorable! And I'm lovin the woodgrain circle! I love that bookmark! The saying is absolutely perfect! AND the card is ADORABLE!! I love how you used the flag pole as your background! i love the bookmark! so cute. Wow love both of these so fun!!! !Thanks for sharing!!!! I adore that bird stamp! I love this bookmark project, I will be saving this idea for later. Thanks for the chance to win! Your bookmark is adorable! And the stripped background - what an idea! Wonderful card. I never think to make things like bookmarks---thanks for the inspiration. The card is amazing but I will be partial to the book mark! Its simple and brilliant! Am so loving the images that Hero and SC have created together! And the bookmark is wonderful! Lovely card and what a great idea for a bookmark. I LOVE that folded bookmark! What a fabulous idea! What a sweet card! I love the sentiment. I must admit, tho', that you've blown me away with the bookmark. I can see one in my future! That bookmark is such a great idea! Gorgeous! Really creative card and bookmark! Love the bookmark idea! Thanks for sharing! The bookmark is so cute ! I love the stamps you used. Great card Kelly and I really love that bookmark!! I really need that cloud stamp as my latest purchase was the cloud punch!! awesome stamps! Love the bookmark! love the card and that bookmark is really cute! Love the bookmark! and I love those stamps. What great ideas all of the designers have. I absolutely adore your bookmark! I'm going to have to make some of my own! Awesome card - love the sentiment. And, I am on my way to my craft room to make some of those bookmarks. I love the bookmark - so clever! Can't wait to make one of those! Your card and bookmark are fabulous, Kelly! I do a lot of reading and I also make bookmarks as gifts. So, this is a wonderful stamp and I love the way you made your bookmark! Thanks for the chance to win. That bookmark is a genius idea! Love the way you used the stamp in a different way on the birdie card. Great new bookmark idea. I'll be borrowing that for sure. Thanks. gosh that is a super cute bookmark! Great idea for the sewn bookmark! Wow great card and bookmark. Love how you used the new stamps! Totally awesome! in love with this bookmark! What a great bookmark! Love it!! I am definitely going to try to make that bookmark...LOVE IT. Such a crafty bookmark...so simple yet functional! That bookmark is awesome! I also love the woodgrain and polka dot clouds on the card. I am definitely going to make a bookmark like yours. Looks so fun! These stamps sets are just fabulous! I love the polka dot clouds on your card and the cute bookmark! Beautiful card. Love the soft colors! Love the bookmark! Such a great idea! Supercute bookmark! I love the background you made as well as sewing on the two side, genious! Cool bookmark! I know I'll be trying one of these. I LOVE the BOOKMARK!!! All 3 of my kids (myself included) live with their heads in a book..I just have to make them some!!! Your card is just as OUTSTANDING!!!! In love with that bookmark! Now I have to have that stamp set for sure1 Thanks for sharing! I love that bookmark! I know several of my far-away friends that will be getting one with their Christmas cards this year! Thanks for that bookmark idea! Awesome bookmark, pretty card! Thanks for sharing! Ah, Kelly, the card IS so soft and pretty...love it! And the bookmark? AWESOME! I'm going to have to try some of them! That bookmark is the bomb! I am gonna need to make some of those! wow!!! Both the card and the bookmark are beyond fabulous!! I LOVE, LOVE that bookmark, Kelly! So cute...a definite lift! I love the diagonal pattern/working the stamps outside the box! Beautiful card - so sweet! I love the bookmark idea Kelly. I want to make them now. Thank you. And that stamp on the bookmark is great. My first thought when I saw your adorable card was "ahhh" as one would coo at a baby shower. Of course, after that moment passed, I thoroughly gazed at your card...and yep, still LOVE it! Can I just say...thanks for also letting us know it works with Fiskars cloud punch. I have that! 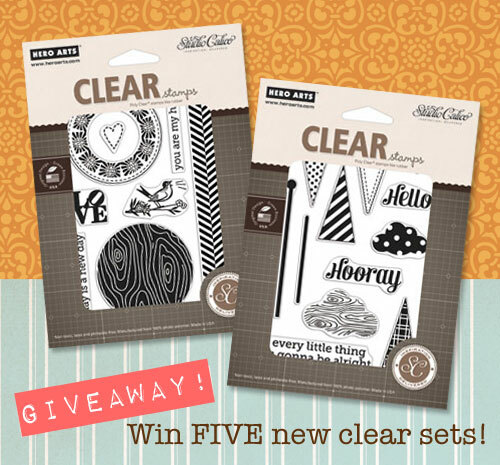 So would love to win this stamp set!!! Oh, and the bookmark...fantastic. It's adorable. I've been trying to figure out what to have my nieces make this fall...I think this is it! LOVE your card, Kelly - I'll bet that those polka dot clouds will become a fixture for most of us! Thanks for the inspiration! That card is so sweet! Love the bookmark idea! so adorable! Especially loving the bookmark! Darling card and wonderful bookmark! So cute! Okay, need to make a bookmark!! That looks great. Bookmark = FABULOUS! I'm loving those little polka dot clouds too! What a great bookmark! May have to make a bunch to tuck away as gifts! Love that book mark! Awesome creations! Love these stamps! Great bookmark! I have vowed to make some this Summer! Jan G (jgarber5@cox.net) Stupid Blogger says I'm anon!!! LOVE the card AND the bookmark! (note to myself: I must try making a book mark like that)!! Thanks for the inspiration, Kelly!! Awesome bookmark . . . I will definitely be making some of those. Thanks for sharing this wonderful idea. Your little card is adorable . . . just love those polka dot clouds! What a very clever idea to make a bookmark like that. And your stamped card is just pure deliciousness! LOVE the bookmark...........What a great idea!!! That is a great innovative design for a bookmark- what a fantastic project! Love your card as well. Fingers crossed on winning a set- either way I'm getting both these sets of stamps! Your bookmark is so cute! Love the bookmark you made! What a gread idea using the flag stick as a design for the bottom of your card! the bookmark is a phenomenal idea! great job showcasing these stamps! I have to make these bookmarks! I love both ideas! Thanks for sharing! Awesome bookmark you've made, love the woodgrain circle! I love that bookmark! I have a few book nerds that would love this!! Supercute! Your stamping skills are awesome!!! love that bookmark! the bookmark is a super cute idea! Both of these projects are so so so cute Kelly! Love the strpes on the first card and that bookmark is so beautiful! Need to go make some! Darling girl! Darling little projects Kelly! Love these color combinations! Love the bookmark idea, I must try this! Sweet little card too! These are absolutely fabulous. I really like the way you created the diagonal stripes... genius. The card is beautiful and I just love the bookmark. I have a few sisters who would love one. Love, love the bird card!!!!! Nice idea. I'll definitely be using it a lot at xmas. Beautiful card and great bookmark! gorgeous card and the bookmark is adorable. Love the way you've used the stamps. I'll be using that bookmark idea. Wonderful! Omygosh! I just love the bookmark! It's too stinking cute! Thank you for the book.ark idea...fabulous! OMG...love that bookmark! I love how you used these stamps. Awesome! I love the bookmark--so sweet! And of course I love those stamps :) I hope to win! Love the vintage look of that cute card! And that bookmark - are you kidding me?! oh! that bookmark is darling!!! i love how you used the new stamps! Such a pretty card, and that bookmark?! I am so scraplifting that!! LOL! Love that lil bird from the stamp set! Love your card and bookmark! So sweet! I really like the way you used that circle stamp and how it's offset! The bookmark is adorable too! That bookmark is going on my to-do list. It's adorable! Thanks for the opportunity to win some fabulous prizes! Man, I am in BIG trouble. I need every.single.set. Both projects are great. The bookmark is very clever. That would make a great stocking gifts for all my family members since every one reads constantly! Great job. That is a beautiful card. And, that bookmark idea is so neat! As a school librarian, I'm going to make some bookmarks as prizes! thanks! I love this blog jump! I love the cards on one blog and then the next are so different, but I love them too! Thanks for so many great ideas! Love the birds...such a sweet card! love the bookmard, such a clever idea!! awesome use of the stamps to make the diagonal background. i would have NEVER thought of that... and i LOVE that bookmark. stamps look like such fun. Love the bookmark - fabulous idea! Beautiful projects, especially love the bookmark. Such sweet projects with these awesome new stamps! Beautiful card and a great design for a bookmark! Clever! I just love these stamps! Your bookmark is so cute! Love the card and the bookmark is great! i need to make one using that formula for the ladies in my bookclub! They would be so happy! What a cute card, Kelly! Love your bookmark too! So clever! Sorry I have trouble using other profile to comment. This is teresaw. Oh! I really loved your cards--that bird is sooo adorable! Cute card, those clouds are so sweet. I love the bookmark. Never thought about leaving two sides open to slide it over the page. I'm going to have to make some of those. The bookmark is awesome - will definitely be trying that idea! and a beautiful card as well! that bookmark is great. what a clever idea. What wonderful projects. And those stamps, they are simply fabulous! oh, that bookmark just triggered so many ideas!!! Thanks! I'm loving the versatility of all these stamps. Great card! And the bookmark is such a cute idea. Such a stinkin cute card! Love the bookmark as well.